Fifty-Six years ago on June 26,1954, on behalf of the Supreme Assembly, Fourth Degree Knights of Columbus, William J. Mulligan, Supreme Master, granted our Assembly a charter as a General Assembly. Council members #836 Lakewood, #3231 Manasquan and #3826 Beach Haven were the Chartered Councils of the Assembly. The Assembly was names in honor of RT. Rev. Msgr. John F Baldwin who was the Pastor of St. Mary Of The Lake Church in Lakewood from 1929 to 1964. Monsignor was the first Faithful Friar of the Assembly and also a strong supporter of the Lakewood-Brick Council and our Assembly. The Chartered Navigator of the Assembly was John F. Masters who was past Grand Knight of Council #836 and former District Deputy. Since his tenure the Assembly has had sixty-one Faithful Navigators who have led us to many successful years and prominence in the state. At the time of organization the membership compromised of twenty-four Sir Knights as chartered members and the Assembly served the three councils in Ocean-Monmouth County area. Currently our membership is 345 and we serve ten Councils in the same counties. Since our Charter was granted there have been 1,300 plus Sir Knights who have joined the ranks of our Assembly. The annual Charity Program was the Assembly's Charity-Cotillion presentation. The charity function was the first presented by the Assembly in April 1974 and the Cotillion presentation was introduced two years later. Funds collected in the amount of $206.700 were donated to the Deborah Heart and Lung Center in Browns Mill. We still support and raise donations through others program to support the Deborah Foundation. The Assembly has the honor and privilege by having one of it's members S.K., P.G.K. James P. Burke, holding the office of State Deputy of New Jersey. Two S.K. Knights of our Assembly held the office as Master of the Second New Jersey District of St. Isaac Joques Province. They are S.K., P.F.N. John R. Evers and S.K., P.F.N. Albert Chrobocinski. The Fourth Degree imparts a lesson on the virtue of patriotism. 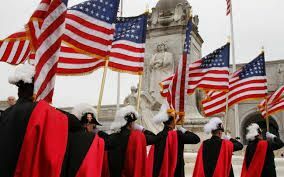 The primary purpose of this degree is to foster the spirit of patriotism in members and the community at large and encourage active Catholic citizenship. Local units, called assemblies, draw their members from Knights of Columbus councils. We also have the "Sweats for Vets" program to provide sweat pants for the vets in our VA Hospitals. Our Assembilies help out with Picnics, Chapel service and recreation activities at the VA Hospitals. Our "One Nation God" program is also an ongoing effort to keep this phrase in the pledge of allegiance. In addition to the District Programs, each Assembbly in our district carries on its own local programs. We are proud to be United States Citizens and we encourage our members and friends to support Soilders, our Government and the things that make this country the place in the world to live. Last but not least we encourage everyone to display the flag of our country and to always display it properly. Eligibility...The qualifications for membership in the Fourth Degree are: membership in the Knights for atleast six months and being a Third Degree Knight. A Fourth Degree Knight may become part of the assembaly's color corps. 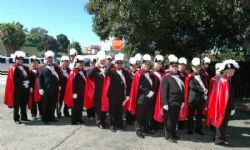 These members are recognized widely by their distinctive attire of tuxedo, feathered hat (chapeau), cape and sword. These members regularly take part in civic events such as parades and wreath-laying ceremonies, and at essential functions at Catholic churches. The various colored capes and chapeau feathers denote different officer positions within the Fourth Degree.